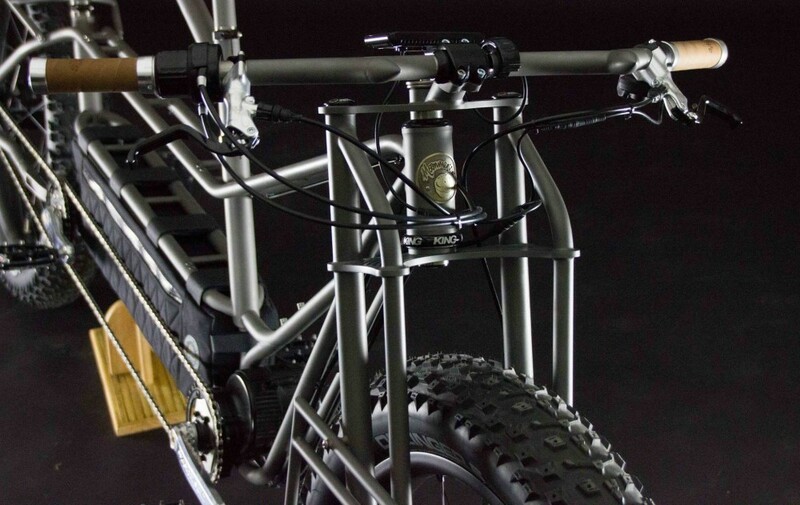 This Moonmen M10 Electric-Assist Tandem Titanium Fat Bike Is Out of This World! I love custom bikes, and I love tandems. When images of this Moonmen tandem first appeared on Facebook, multiple friends tagged me in the posts, knowing that this would be right up my ‘Alee’ (I’m no dad – but sorry, couldn’t resist!). Speaking of dads though, this bike was actually built for a dad and his son to use as an exploratory tool on the varied terrain in New Zealand. Anyway, my friends were right; this bike tickled me in places that I didn’t even know could be tickled. The Moonmen M10 is pretty darn special. 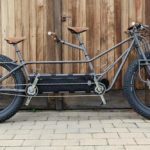 Firstly, because there aren’t too many fat bike tandems in the world; secondly, because there aren’t too many electric tandems in the world, and thirdly, because this tandem is littered with 100% custom parts. 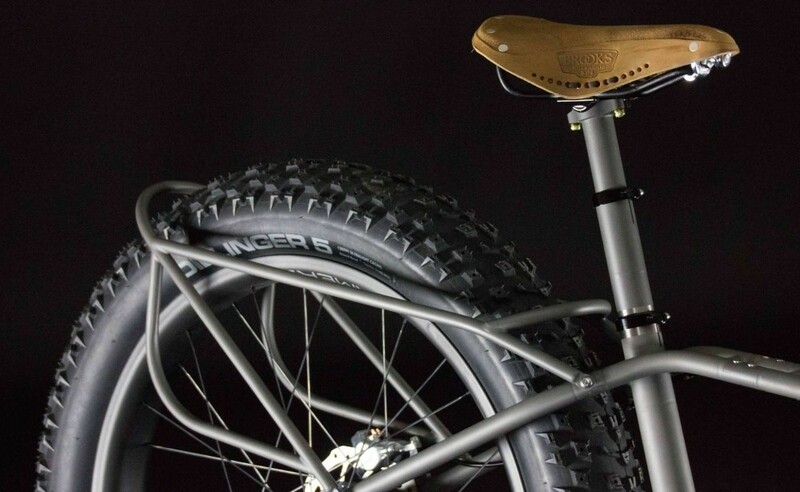 The bike was constructed by Todd Heath at Moonmen Bikes. Todd raked up over 10 years of experience working with titanium at Black Sheep Bikes, before starting his own venture two years ago. What Todd has managed to create here is a bike that blurs the lines between gorgeous metalwork and pure utility – let’s take a closer look. 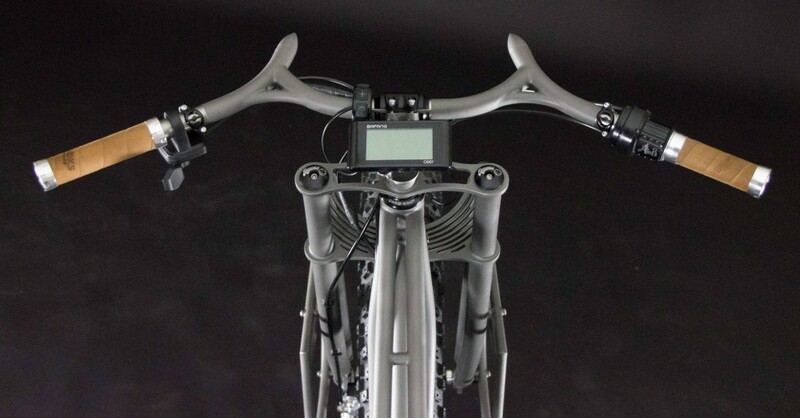 Up the front of M10 is a one-of-a-kind, triple clamp truss fork. The design is supposedly more compliant than a unicrown fork, and given the heavy capacity of the bike (two riders + gear), it should aid in preventing brake shudder. The fork crowns are CNC machined, reducing weight and adding a whole lot of cool. Every single component of the fork has been made in-house by Todd. Don’t forget to admire the custom head badge fabricated by jewelry maker and cyclist, Jen Green. 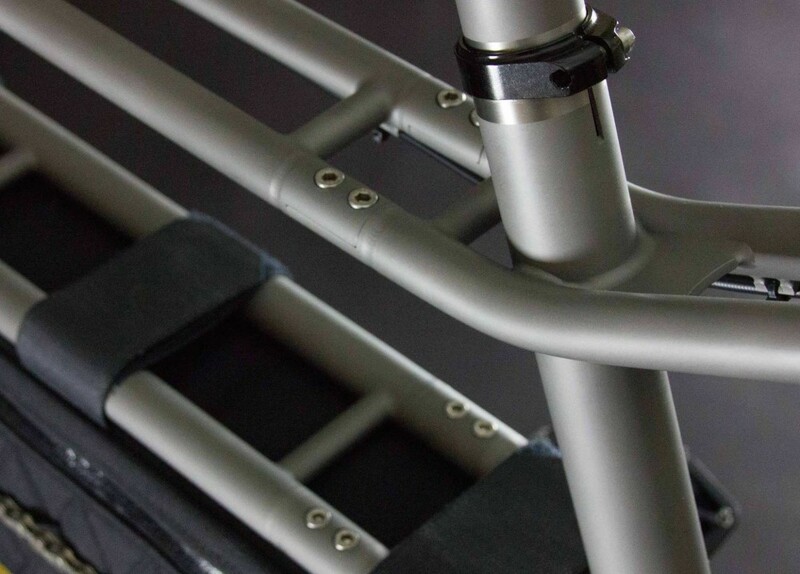 The M10 is built with custom titanium handlebars that have integrated ‘aero bars’ in the middle, allowing the pilot to switch up their hand positioning when they feel appropriate. The shape of the cockpit and accessories is incredibly pleasing on the eyes; it really is a work of art in itself. A centrally-mounted Bafang computer provides all of the metrics, including trip distance, speed and battery level. The mid-drive Bafang 750 watt motor operates not like a motorbike, but as a pedal ‘assistant’. It’s a pretty simple distinction really – there’s no throttle on the bike, so if you don’t pedal you’re not getting any help. In fact, torque sensors at the cranks work out exactly how hard you’re pedalling; the motor kicking in a proportionate amount of assistance. As soon as you reduce your leg power, the motor reduces or cuts completely. With all e-bike motors you choose how much assistance you receive – the more assistance, the less distance you’ll be able to cover with your battery. Todd set up this tandem as independent drive, so both riders don’t need to be pedalling at the same time. This is his own design with a freewheel built into one of the cranksets. Andrew the Maker joined forces to create a bag to house the Bafang battery in the lowest possible location (maximising the handling of the bike by dropping the centre of gravity). 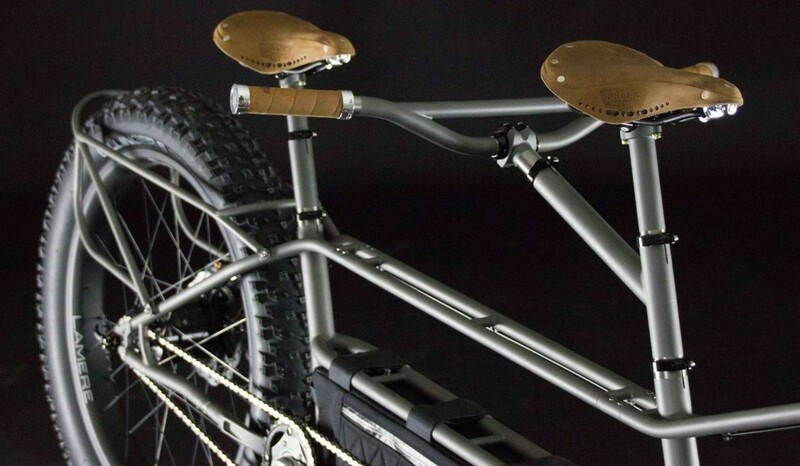 This tandem features an array of tube splitters to separate the bike into multiple sections. 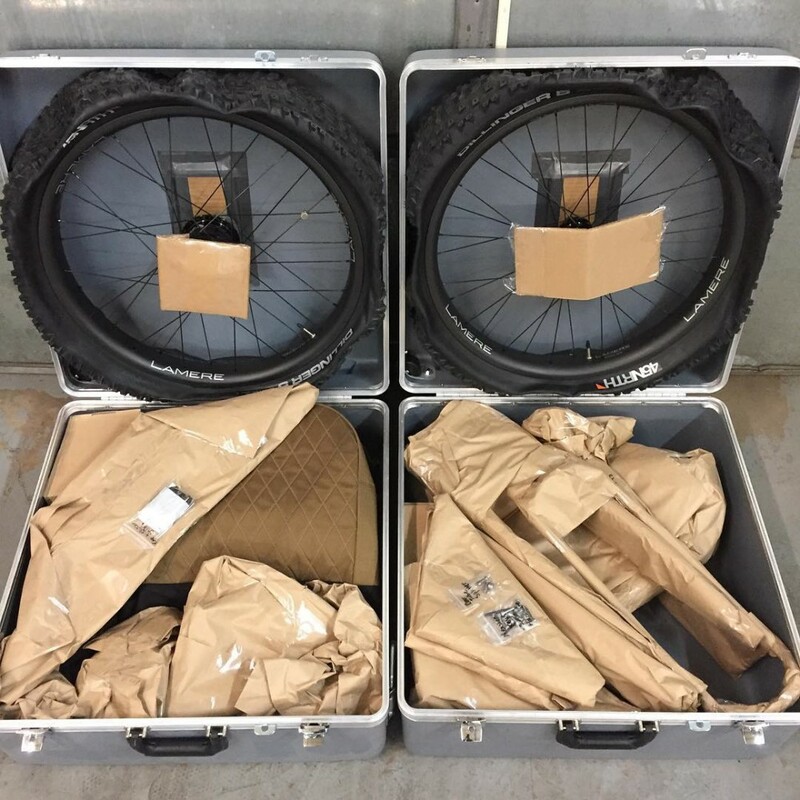 The whole tandem fits into two S&S hard shell bike cases, believe it or not. I’ve included pictures below for proof! 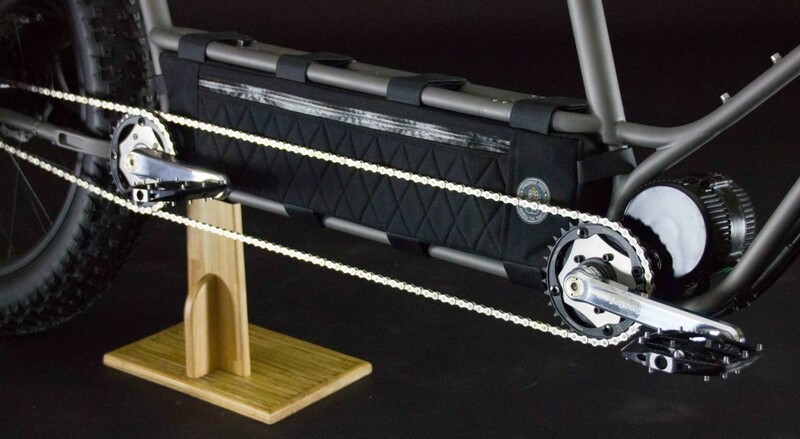 The Mension chain tensioning system is a unique take on making sure your chain doesn’t drop off. It’s hard to make out (go HERE for a closeup), but incorporated in the chainstays are really cool turnbuckles to increase their length. The tensioners are actually dual purpose, as they can be used to separate the frame entirely to fit it in a box. 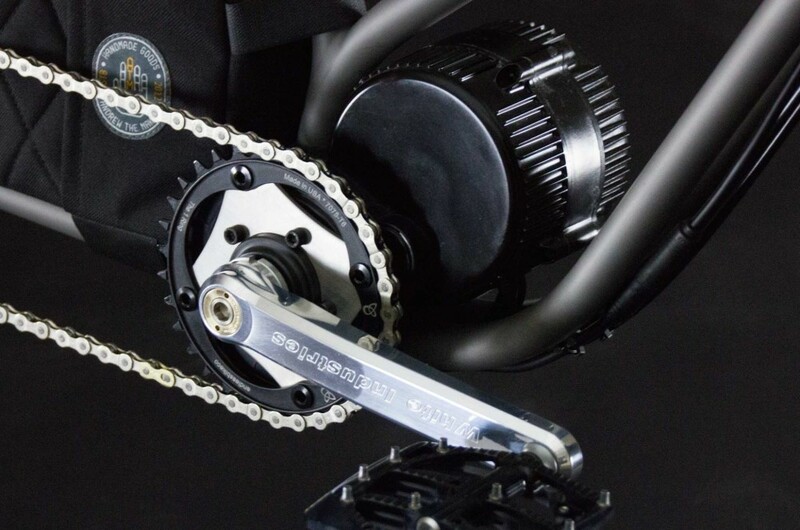 A 14 speed Rohloff gearbox hub provides all of the bike’s gearing needs, as well as ensuring minimal maintenance in the harshest terrain. The gears and cogs are all sealed away from the elements within the rear hub shell. Todd put together some custom titanium racks on the M10 so that this father/son combo can carry enough gear for multi-day adventures. You’ll also notice that there’s easily enough room for five inch wide tyres. The telescoping seatposts are just another of the custom parts to add to the list. Andrew the Maker sewed up some panniers to go along with the battery cover; the sandy brown material complementing the brown Brooks saddles and grips. 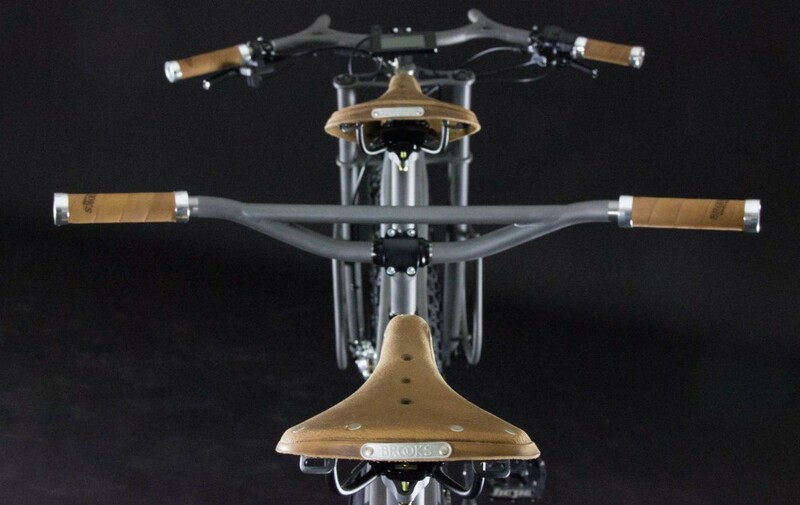 The custom stems and handlebars are immediately obvious from the rear viewpoint. These wide titanium handlebars make slow speed technical riding a breeze given the additional leverage that they offer. Ok, you’ve been waiting for this – it’s the M10 in all it’s glory! That’s a whole lot of custom made, right there. Bravo Todd! 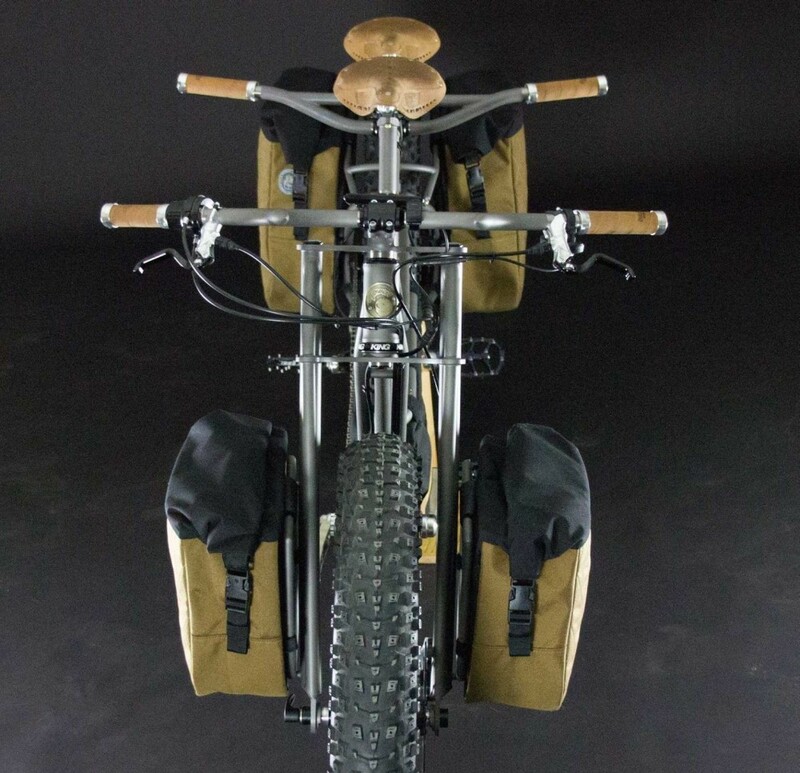 And finally, as I briefly mentioned above, this fat tandem has been designed so that every component can fit into two S&S hard shell bike cases. That makes bike travel infinitely easier (and cheaper), and if you were to live in an apartment you could even store it in your wardrobe. 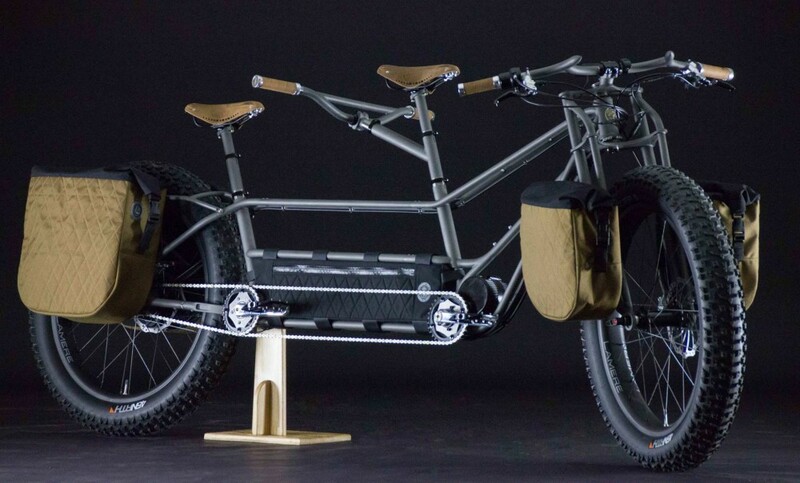 This Moots Snoots Fat Bike and Trailer for Antarctica is Wild!